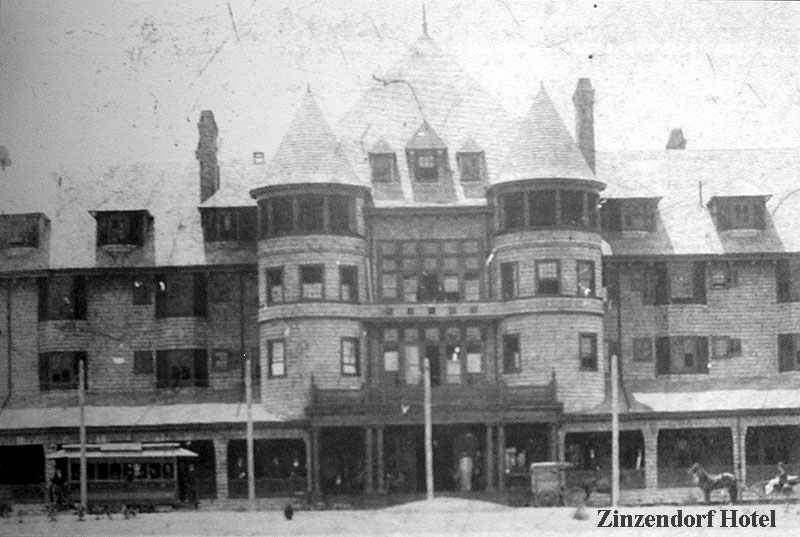 The morning of July 21, 1892 the body of Ellen Smith was found behind the Zinzendorf Hotel in Winston-Salem, North Carolina. She had been shot through the heart. 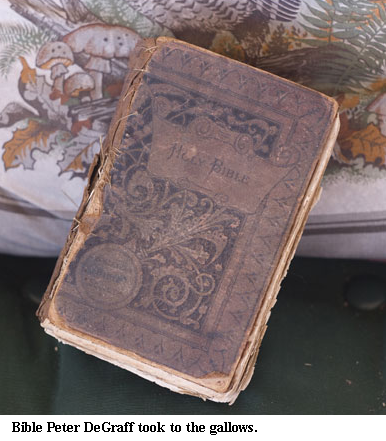 The story of Ellen Smith’s murder is a classic tale of seduction and betrayal. A beautiful but innocent young woman strays from the path of righteousness for a faithless lover who soon becomes her killer. It is the stuff of Victorian cautionary literature and mountain murder ballads. 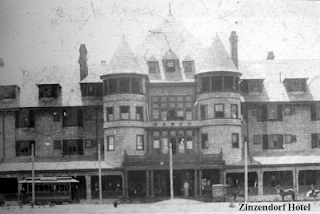 She was seventeen, and probably working at the newly opened, luxurious, Zinzendorf Hotel in the West End of Winston, when she met Peter DeGraff. DeGraff was in his early twenties and probably also working at the hotel as well. He lived a reckless life; at an early age he began, drinking whiskey and carrying a pistol. DeGraff had many run-ins with the law and was arrested at least once. He had been arrested and jailed for carrying a gun but managed to escape and flee to Virginia. The newspapers described him as a ladies man who had seduced and “ruined” or “gotten in trouble” many young women. His relationship with Ellen Smith followed much the same course. Ellen was pregnant in July 1892 and she may have already borne DeGraff a child that had died in infancy. It is unclear exactly what prompted the murder. DeGraff may have initiated a quarrel to break off the relationship when Ellen began to push for marriage. Or he may have been jealous of her relationship with another man. One theory speculates that Ellen sent DeGraff a note saying she did not want to see him anymore. In either case, DeGraff probably sent Ellen a note asking her to meet him in the woods behind the Zinzendorf. A note from him was found on her body but the content has been lost. Ellen was killed on the afternoon of July 20, 1892 by a single gunshot through the heart. There were powder burns on her apron and dress indicating that she was shot with a pistol at close range. The body was found in the woods behind the hotel the next morning after an unknown man told several people where to look. It is speculated that the man was Peter DeGraff who wanted Ellen’s body to be found. Reportedly, Peter DeGraff showed himself to many people and taunted the sheriff to come and get him. But nothing was done until Forsyth County elected a new sheriff. That evening he was found hiding under a feather mattress in a house near a tavern where he had once worked. DeGraff was charged with murder in the first degree and he pled not guilty. 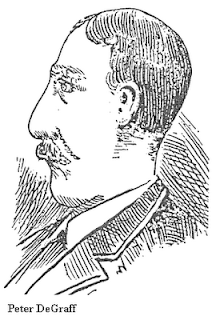 He claimed he did not murder Ellen Smith, but when he took the stand DeGraff said he returned to the scene of the crime because he heard an old saying that if a person who committed a murder returned to the scene and spoke the right words, the victim would appear—exactly what he was seen doing the day of his arrest. That one statement probably sealed DeGraff’s fate. The trial lasted three days and the jury deliberated for twelve hours before returning a verdict of guilty. The case was appealed on several technicalities but the verdict was upheld. DeGraff’s attorneys petitioned North Carolina Governor Julian S. Carr for a stay of execution but that was declined as well. DeGraff was sentenced to hang. "I stand here today to receive my just reward. I again say to the people here, beware of bad women and whiskey...don't put your hands on cards, bad women and dice. Hear my dying words." 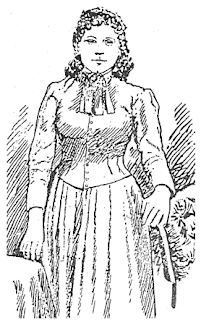 The ballad “Poor Ellen Smith” appeared soon after the execution. It tells the story from the point of view of the condemned man and it was allegedly written by DeGraff himself. This is unlikely; the same claim was made in the cases of Frankie Silver and Tom Dula. It has also been claimed that the ballad, which professes the condemned man’s innocence, was so inflammatory that it was outlawed for a time over the fear that it would incite violence. Murder Most Foul - "Poor Ellen Smith"
Casstevens, Frances Harding. Death in North Carolina's Piedmont: Tales of Murder, Suicide and Causes Unknown . Charleston, SC: History, 2006. This is an excellent accounting! I hope it's accurate although if it isn't it's still really good. How were you able to research this? Very enjoyable I've just recently started learning the ballad of Poor Ellen Smith. I love the song (Don Reno and Bill Harrell version)with the back story it's even more enjoyable. 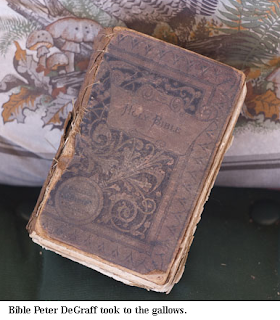 The story comes from the sources listed above, particularly the book _Death in North Carolina's Piedmont_. It is a good song as well. Where did you hear that she was pregnant at the time of the murder? I've researched this case somewhat thoroughly, and several sources tell of the child who died at birth, but none mention her being pregnant at the time of her death. I'm not saying you're wrong, but I'd like to see where you got that. Gracias. I saw another source say she was pregnant. Such is the problem with stories like this, where many of the facts have been lost. Caroline, do you remember the other source? I re-read the story in the Casstevens book - he says DeGraff got Ellen "in trouble" and it was believed she had already borne DeGraff's child. I can't tell for certain if he is referring to two seperate pregnancies or only one. Another source would be good to see. I could probably find it. I'm sure I have it on my favorites. I'm not exactly sure where this person got that information. It'd be nice if everyone listed their sources. This is from the Myspace of Randy Furches, a relative of DeGraff. Thanks for the links, Caroline, I think I will add both of them to the post. I agree, it would be helpful if everyone listed thier sources. I am related to Peter Degraff also, but not sure of the relationship. My great-grandmother was a DeGraff and my dad (who is now deceased) always told us we were related to the infamous Peter DeGraff. I grew up in Winston-Salem and have lots of relatives around the area...maybe we are related? I am older than you of course--just turning 65. Would love to hear from you. The last link, to the MySpace Account, is no longer valid. Perhaps he has gone on to Face Book or can be found on Ancestry? Just heard the song and wanted to research on this. Thanks for the information. Interesting story for a movie.